Once again, the Moylan IcePlex in Omaha was the site of the Lincoln Stars tryouts, Day 2 edition. I was not able to attend the two morning scrimmages, but a very kind anonymous poster who attended was nice enough to give their opinions on what they saw. Just want to say 'thanks' to the person who wrote this recap. It is very much appreciated. "Went to the Saturday morning tryout session. Team Yellow (2-0) defeated Team Red (1-1), 4-2. Jared Coreau (6'4", 200) had his second straight shutout in net for the Yellow team. Matt Green did not give up any goals in the 2nd half of the game for Team Red. Team Blue defeated Team Black, 5-3 I think, in the second game. It was the Blue Team's first time on the ice and they had some good forwards. Corey Morbeck gave up 0 goals for the Blue team in his time in net. He's 6'2" and from Team Illinois. Overall, Dominic Shine, Kyle Gibbons and Michael Ambrosia were some of the best players I saw this morning. The Ambrosia-Gibbons-McCarron line was very good and controlled the puck most of the time they were in. I was surprised to see Jack Callahan trying out, and not as surprised to see that Chris Volonnino wasn't trying out. That should create a spot for Puskar to fill an '89 spot. I thought he was a good USHL player." As for the two scrimmages in the evening, I was able to make it to the later one, Team Blue vs. Team Yellow. 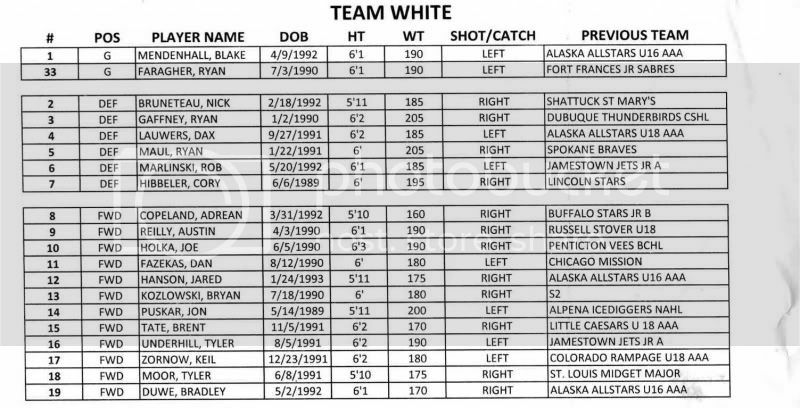 I was not able to attend the Team White vs. 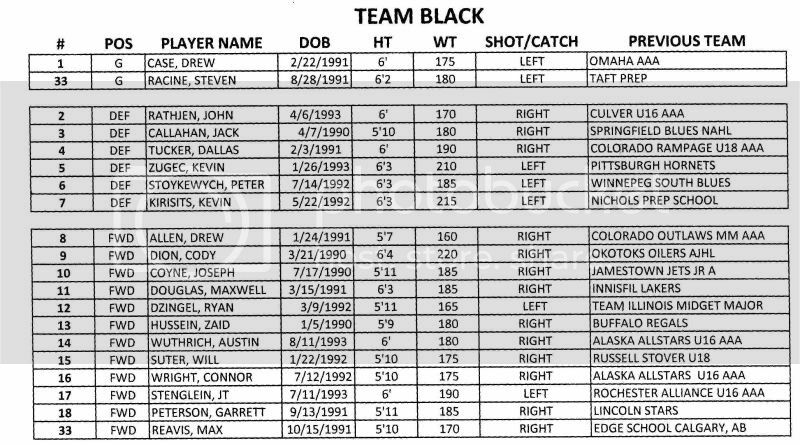 Team Black game which was held at 7pm. From what I heard, Team White (1-1) beat Team Black (1-2). I did not find out what the final score was. I did hear that goaltender Steve Racine (Black) did play very well again. I was told he only gave up one goal in his 30 minutes between the pipes. There was some fights in this game also, as Cory Hibbeler (White) slugged it out with Cody Dion (Black). From what I heard, Hibbs connected quite a few times and won the fight. I also heard that Jon Puskar (White) and Garrett Peterson (Black) also fought. If anyone out there has more info about this particular game, please feel free to comment. The second scrimmage saw Team Blue (1-1) stomp all over Team Yellow (2-1) by a score of 6-1. I was VERY impressed with how well the players on Team Blue played as a unit. I don't know if Team Yellow was fatigued, but they sure played like they were. Goaltender Ryan Walsh (Yellow) surrendered four goals during his 30 minutes in net, and Jared Coreau gave up two goals during his 30 minutes. I thought Coreau played well, despite giving up the two goals. He had previously held two teams scoreless, so this was the first scrimmage he gave up any goals. His defense in front of him really hung him out to dry at times. 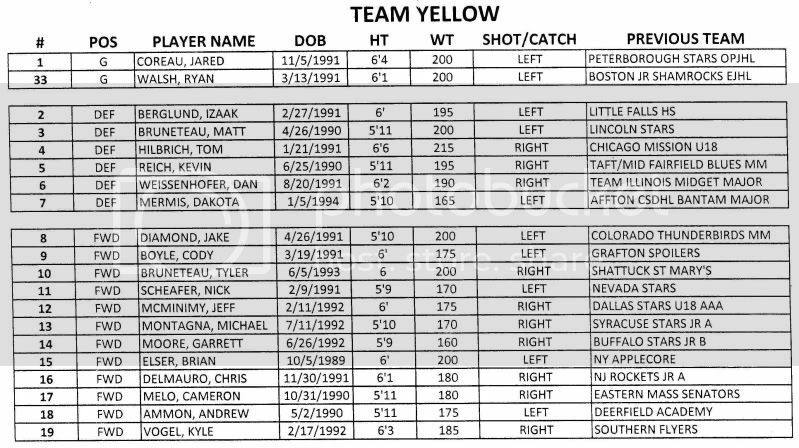 Team Yellow did not test the two goaltenders for Team Blue. There was one fight in this game, as John McCarron (Blue) dropped the mitts with Chris Delmauro (Yellow). Both players landed few if any punches, but Delmauro gets the win with the takedown at the end. Players on Team Blue that stood out positively to me: #17 Dominic Shine ('93-F) two goals, #8 Michael Ambrosia ('92-F), #11 Kyle Gibbons ('91-F) one goal, #5 Colton Saucerman ('92-D) one goal, #9 William Brockett ('90-F), #2 Nate Baumbick ('91-D) very physical play. 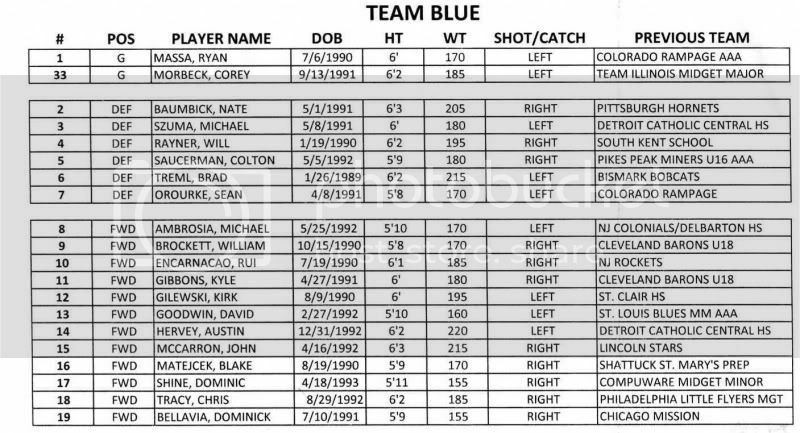 Very interesting that quite a number of the same players on Team Blue that the anonymous poster mentioned (Ambrosia, Gibbons, Shine, Saucerman) were players that I also mentioned. Dominic Shine really impressed me with his all around play, especially considering that he is one of the youngest players participating in these tryouts. Very impressive. I know Gibbons would impress, but he looked very solid. Ambrosia was all over the ice Saturday night, and Saucerman has some very impressive offensive talents as a defenseman. I will not be able to attend the Sunday morning tryouts, so again...I really hope one of my readers can give us a quick recap. I will be in attendance for the Sunday evening games, so I'll be looking forward to that. very interesting yeti. Baumbick and Brockett were two guys I was going to put on, but didn't want to feel like the entire Team Blue impressed me (even though many of them did.) They came out blazing in their first shift on Saturday morning. thanks anonymous. I couldn't remember who won that game. It seemed like Blue played better but I was thinking Black made an emptynetter for some reason. there's no doubt the blue team has some good players. encarnacao, shine, gibbons, ambrosia, these guys have all been putting up points. Black has lost all its games and blue has won all. Would be nice to see some closer games - guess there are just some groups that mesh more quickly. Last game tonight is Blue vs White which seem to be the best of the teams, so may see a closer game then. Lots of standouts as have been mentioned. Coaches have a lot of really good players to choose from, but do not envy the decisions to be made. Really hope to see Copeland (# 8 White team) and Gibbons (#11 Blue team), among others, this fall. Go Stars! Thank you so much for all the replies and help. I hope you guys don't mind, but I would like to include the information you gave me in my Tryout Day 3 article. I'll be posting a lot more very soon...including an in-depth analysis of the all-star game this morning.